While I was writing last week’s frog blog, I came a cross a particularly interesting amphibian called the dotted humming frog. If you saw a dotted humming frog, you may not think it was particularly exciting – they’re a dull brownish-gray, and no bigger than your thumb. But the humble dotted humming frog is friendly with the burrowing tarantula. They have what’s called a symbiotic relationship: the frog eats ants and other pests that could harm the spider’s eggs, and the much larger spider gives the frog protection from predators (the frog also gets to eat the remnants of the spider’s food, which makes for an easy meal). In some sense, the tarantula keeps the dotted humming frog as a sort of pet. Unlikely friends with benefits. Image via Roaring Earth. These sorts of interactions between animals are examples of symbiosis, which comes from the Greek for “living together”. There are a lot of species in the world, and many of them rely on each other for survival (and not just in the “I’m going to eat you so I don’t starve” sense). Simply speaking, symbiosis is a relationship between two different organisms that benefits one or both of them. Symbiosis can be optional (as in the case of the dotted humming frog and burrowing tarantula), or it can be obligatory; sometimes species become so intertwined that they evolve together, often to the point where one can’t survive without the other. This week, we’ll break down the different types of symbiotic relationships, and look at some fascinating examples of each one. Both the clownfish and the anemone benefit from their relationship. Image by Jan Derk. When people talk about symbiosis, they generally are referring to mutualism (also known as reciprocal altruism). A mutualistic relationship benefits both organisms, like the dotted humming frog and burrowing tarantula. The best-known example of mutualism is probably pollination – a bird or an insect travels from flower to flower, drinking nectar and spreading pollen around so the flowers can reproduce. Another well-known symbiotic relationship is between clownfish and anemones – the clownfish eats small invertebrates that could harm the anemone, and its waste provides the anemone with nutrients. In the meantime, the anemone’s stinging abilities provide the clownfish with protection from larger predators. An Atta columbica colony, with the giant queen and workers on a fungus garden. When a new queen leaves to start her own colony, she’ll carry a piece of the fungus with her to start a new garden. Image by Christian R. Linder. My personal favorite mutualistic relationship is between ants and fungi. As I’ve mentioned before, I used to work in the AntLab at the Smithsonian’s National Museum of Natural History, where the main research was on fungus-farming ants. Some 50-60 million years ago in the Amazon basin, some ants started eating, and then growing fungus. Now there are around 200 ant species that grow different types of fungi, many of which have evolved along with the ants. Now there are many ant species that can only eat their particular fungus, and that fungus only exists through the care and cultivation of that ant. Remoras stuck to the underside of a manta ray. Image by Mbz1. Not every symbiotic relationship benefits both parties. In many cases, only one partner gets anything out of it. A commensal relationship benefits one organism, and has no effect on the other, for better or for worse. Commensal organisms make use of other organisms for transport (e.g. mites on an insect), shelter (e.g. birds nesting in tree hollows, or hermit crabs using snail shells), and to get food (e.g. birds following larger animals where they may have kicked up bugs in their wake). Pilot fish, for example, travel with larger fish and marine mammals to eat the leftovers from their meals, and remoras actually physically attach themselves to sharks’ undersides using a sort of suction cup on their heads. The presence of pilot fish or remoras doesn’t affect the host fish at all. On an interesting side note, commensal symbiosis accounts for the domestication of dogs, as well as cats, fowl, and pigs to a lesser extent. Some 14-15,000 years ago (a few thousand years before the dawn of agriculture), wolves started hanging around human camps – first just for easy-to-access food, and then later, for protection against more aggressive wolves. They also started to evolve features that made them more appealing to humans – they appeared younger, were more docile, and were less threatening to humans (a process called neotonization). We humans eventually continued that trend through selectively breeding for traits we liked, leading to the hundreds of different domestic dog breeds we know today. 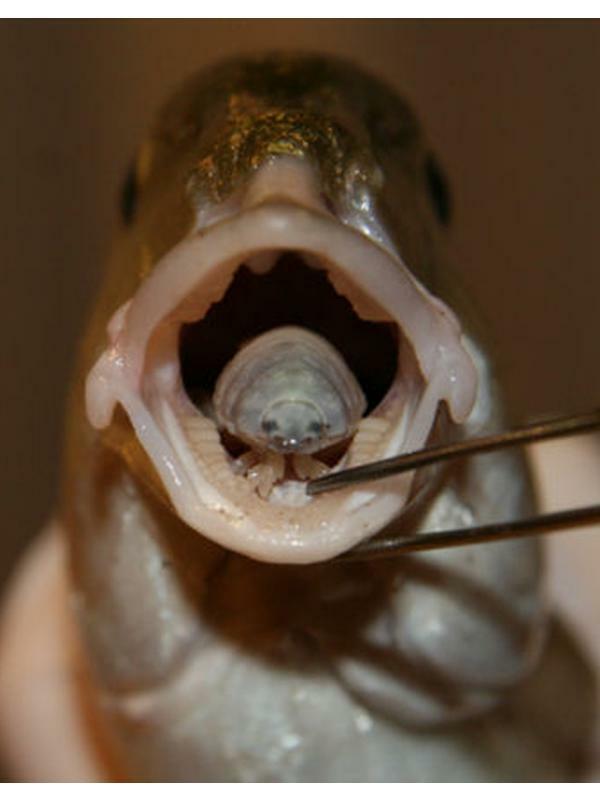 This parasitic tongue-eating isopod has taken up residence in a fish’s mouth. Image by Maria Sala-Bozano/ University of Salford. Reed warbler feeding a cuckoo chick. Image by Per Harald Olsen. In a parasitic relationship, one partner benefits while the other is harmed in some way. The parasite’s success comes at the cost of some aspect of the host. A lot of our familiar pests are parasites, like fleas, lice, and mosquitoes. Mosquitoes carrying malaria actually pack a double-whammy, since malaria itself is caused by a parasitic protozoan. Other famous parasites include things like tapeworms and hookworms, mistletoe, and vampire bats. Social parasitism – when a species mimics the behavior and interactions of another species in order to take advantage of them, e.g. caterpillars infiltrating ant colonies for easy access to food. Brood paratism – when the parasite mimics the offspring of its host, e.g. the cuckoo lays eggs in the nests of other birds, leaving the baby to be raised by the host (at the expense of the host’s own chicks). Kleptoparatism – when the parasite steals food already collected by the host, e.g. the skua is specialized for snatching meals from other birds. Sexual paratism – The male anglerfish is probably the best example of this, and no one explains it better than The Oatmeal (link is kind of nsfw). A red billed oxpecker perched on a giraffe. Image by Bernard DUPONT. Several symbiotic relationships are based on one species cleaning the other, or rather, one partner eating parasites and detritus off of the other partner. It’s unclear whether these cleaning-based relationships are mutually beneficial for both parties, beneficial only to the cleaner getting a meal, or if the cleaners are parasitic themselves. There are several small fish and marine invertebrate species that feed almost exclusively on detritus from larger fish; the best-known of these is the (appropriately named) cleaner wrasse. This sort of behavior has also been seen on land – the red billed oxpecker can usually be seen perched on the packs of large mammals like antelopes, giraffes, and buffalo across sub-Saharan Africa, eating the bugs and other pests that live in the larger animal’s fur.